The search found 366 results in 0.097 seconds. “Washington’s failure to address the national debt and critical budgetary issues has a direct negative effect on Americans’ confidence,” said Michael A. Peterson, CEO of the Peterson Foundation. Modeled after the Consumer Confidence Index, the Fiscal Confidence Index is a national survey that measures public opinion about the national debt. 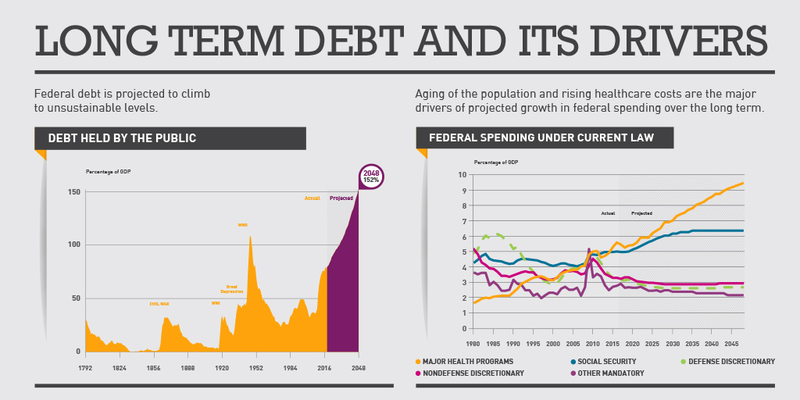 Despite a growing economy and low unemployment, federal budget deficits are projected to grow over the next 10 years. “CBO has once again provided clear evidence that we must do something about America’s dangerous fiscal situation," Michael A. Peterson, CEO of the Peter G. Peterson Foundation, said. “This shutdown has negatively affected the lives of millions of Americans, disrupted essential government services, and unnecessarily harmed the economy." Michael A. Peterson, CEO of the Peter G. Peterson Foundation, said. Putting our nation on a sustainable fiscal path creates a positive environment for growth, opportunity, and prosperity. Unfortunately, America is on a dangerous long-term fiscal path. Every month the U.S. Treasury releases data on the federal budget, including the current deficit. Here is the data for November 2018, which was the first month of fiscal year 2019. Every month the U.S. Treasury releases data on the federal budget, including the current deficit. Here is the data for December 2018. Since the shutdown began, about 800,000 federal employees have been furloughed or are working without pay. “This new rules package includes important reforms that can help encourage fiscal responsibility." Michael A. Peterson, CEO of the Peter G. Peterson Foundation, said.